What makes a great small business? 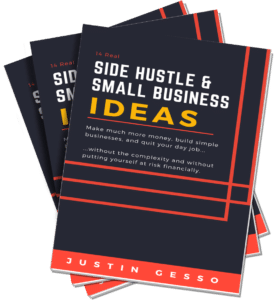 If you’re brainstorming new side-hustle and small business ideas, it’s important to have a foundation in the characteristics that will set you up for success. So here are 8 characteristics of a great small business. These characteristics should cause you to identify unexpected opportunities. And they should improve your chances of long-term success. What makes a great small business? 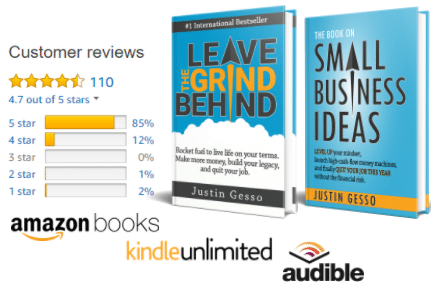 If you’ve followed my blog or read my book Leave the Grind Behind, you had to see this coming. A small business needs to be your small business. It needs to be interesting, exciting, and enjoyable to you. It should fulfill your mission and give you the lifestyle you desire. Small businesses thrive when they target a very specific set of people and a specific problem. There’s plenty of room to broaden later, but think specific to start. Remember, Amazon.com started as an online book retailer (Wikipedia). Jeff Bezos, in fact, started by creating a list of 20 products he could sell online. He narrowed it down to one, books, and ran with it. The rest is history. As you brainstorm ideas, consider taking any one idea (such as selling online) and breaking it down into 20 specific ideas (selling books online, selling courses online, etc…). Earning income passively means your potential income isn’t limited by your time. You put in effort or money upfront, but then begin earning indefinitely. This can be achieved through investing, having intellectual property, automation, or by hiring people. Even ideas such as consulting can grow and generate money without you as long as you’re able to build the right team and systems to deliver. What ideas can generate money without your constant involvement? Much like passive income, scalable income is not limited by your time. However, it has another quality: ability to hit massive quantities. If you can sell 100 per month or 100,000 per month without much change in your direct effort, then your idea is scalable. Owning a rental property would a passive income source, but not scalable. Writing a book and exposing it to millions of people is, however, scalable. Where’s the big payoff? Selling! Investors buy businesses. Competitors buy businesses. There are many ways in which you can ultimately sell your business. Keep this goal in mind and think of ideas that will generate value for potential buyers. In contrast to some of the bigger concepts in this list, many of the best ideas have their roots as local small businesses. Being local allows you to spend time with customers and really understand what they need and want. With this deep understanding, you’re better able to successfully go big and global with your ideas. When your initial customers, vendors, employees, and partners come from your network, life is easy, familiar, and predictable. Great small businesses afford you the ability to add value to people who already trust you. To the extent you can start selling to close people as opposed to cold, anonymous people, the better. Likewise, if you can build your team, create a partnership, and fulfillment process with people you enjoy and trust to deliver, the easier success will come. Similar to the “local roots” concept, building a business around your network allows you to start strong and create a rock-solid foundation before going big. Contrary to what you may hear and expect, many of the best small businesses are not based on new concepts. Rather, great small businesses start on a paved path and introduce minor innovation. Creating a new market for a new idea or product requires educating huge numbers of people on your new concept, long periods of trial and error, and significant development work. In other words, it’s insanely expensive and not where most of us will operate. So why not let someone else spend the money, create the market, and learn the pitfalls? Don’t start from scratch. Rather, start with an existing business model that is already proven to make money, really understand why it’s successful, and then implement it yourself with minor innovations. Follow a model. Find a paved path. Alright, let’s close this post with an exercise! Did this list get any of your creative juices flowing? If so, make sure to capture your small business ideas in a notebook. Even high-level ideas should be written down. Ideas can be fleeting and you never know how they’ll evolve. Jot down at least ten business ideas right now. And if you have any questions or comments, hit me up in the Comments section below!